As I am still repotting the erythroniums I am forced to show you more of their bulbs and I have sacrificed this one to further the better understanding of their structure. 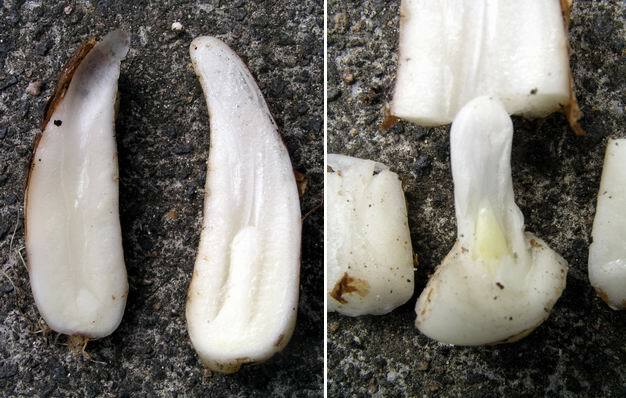 Sliced down the centre: the left hand half is a stored food source, mostly starch, while on the right you can also see the main bud towards the bottom of the scale. I have further dissected the right hand piece to emphasize this tiny bud from which will grow next spring's flower. 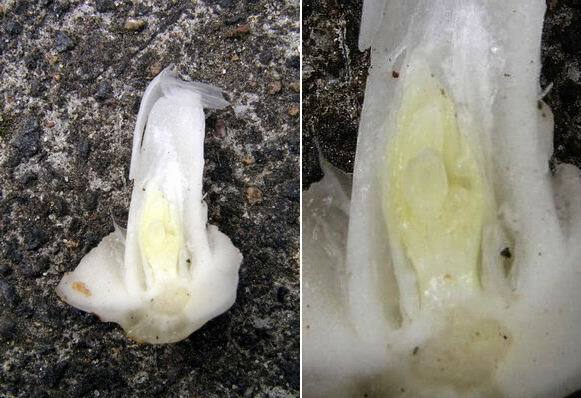 A further series of dissections shows that this bud already contains the leaves and flower in embryo form; you should be just able to pick out the flower pointing upwards in the right hand close up. This bud is not dormant but will grow, very slowly, over the autumn and winter months so that when spring comes round it is ready to push up and flower very quickly. By late November it will be about 1cm long. Last week I said that I favoured erythroniums as having corms; this seems to suggest that they behave as bulbs but I still have a foot in both camps! I am always driven by a challenge and apart from wanting to have all the erythronium species flowering in our garden, I was further driven to flower Erythronium montanum by the many articles that I had read which said it could not be flowered in cultivation. I have raised it from many wild seed collections and now have a regular supply of our own garden collected seed. To remind you of what it looks like; here is its beautiful crystalline white flower which is the last of all the erythroniums to open. This lateness of blooming is probably because it is a snow melt plant, often called the 'avalanche lily'; it mostly grows at higher altitudes than the others. It is however the first to ripen its seed giving it by far the shortest time from flowering to ripe seed of all erythroniums. 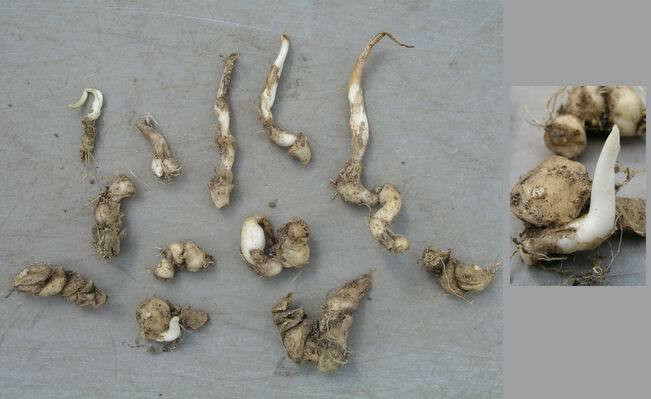 The bulbs of Erythronium montanum are very interesting and as much as I keep saying plant your bulbs very deep, the picture on the left shows that these bulbs are actually pushing themselves upwards. Could this be an adaptation to avalanches? 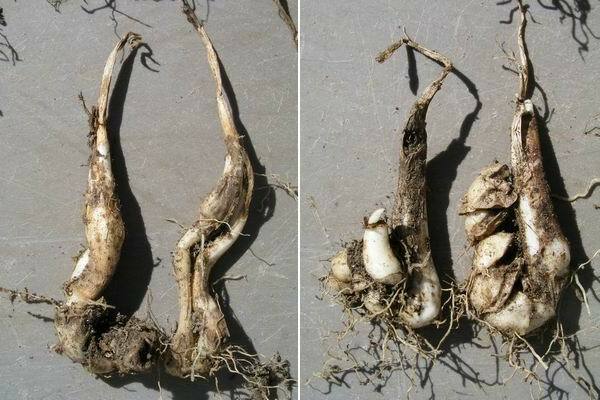 The chain, remnants of the old bulbs, on the right is typical of Erythronium montanum bulbs and sometimes secondary bulbs will bud off of this chain. A few years ago I decided to see what would happen if I removed the chain from the bulb. Removing it had no detrimental effect on the main bulb and by separating and splitting the chains into individual links, I got a whole lot of young bulbs forming on the chain links. Obviously there are dormant buds all along the chain and if anything happens to the dominant bulb they get the message to spring into growth. 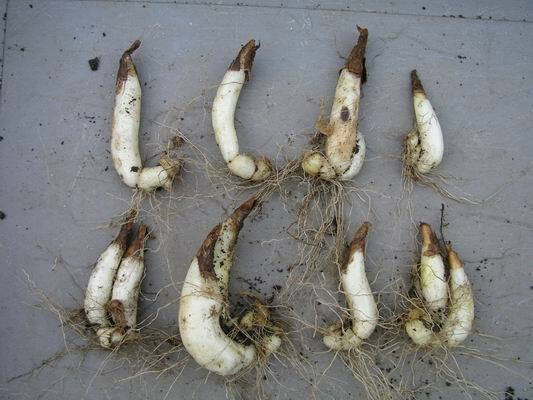 Erythronium dens canis bulbs also have this retained chain and it can be increased in the same way. I generally find that most forms of dens canis increase quite well with out the intervention of removing the dominant bulb from the chain; as you can see above, many will form offsets each year. Closley related to dens canis is Erythronium sibericum and these are three year old seedlings which I hope will flower in the spring of 2007, it should be well worth the wait. 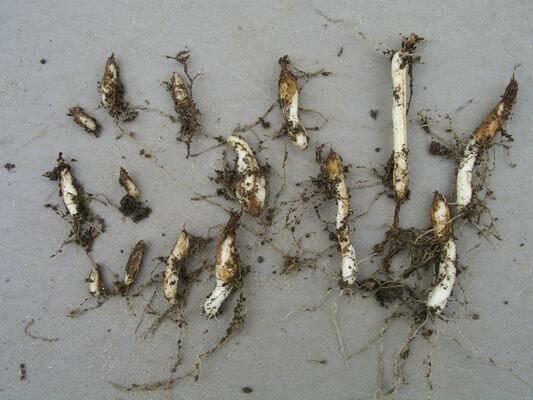 Just to show that it is high time I got the erythronium repotting finished, here are some bulbs well into root already. I have now repotted all 16 mesh baskets that fit neatly into this plunge frame tagged onto the side of one of our raised slab beds. The sand that I used in the plunge is very fine soft sand, not the sand I would usually use but it was all I had at the time of construction. I am amazed at how many of the erythronium bulbs had made their way underneath, out of these baskets, in the two years since they were last done. The bulbs seem to love growing in this soft sand, not sharp sand as is usually recommended - it is this sort of accidental discovery that can help us to develop better ways to grow our bulbs and it shows we should always be willing to experiment and not take things we read as gospel. 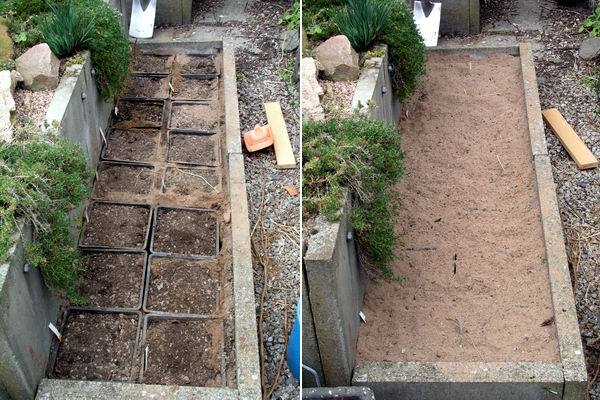 To try and prevent the bulbs escaping downwards I have plunged the baskets that bit deeper and have put the excavated sand on top of them, I will add more sand to top off this bed so that the top of the baskets will be at least 7-8 cms deep. 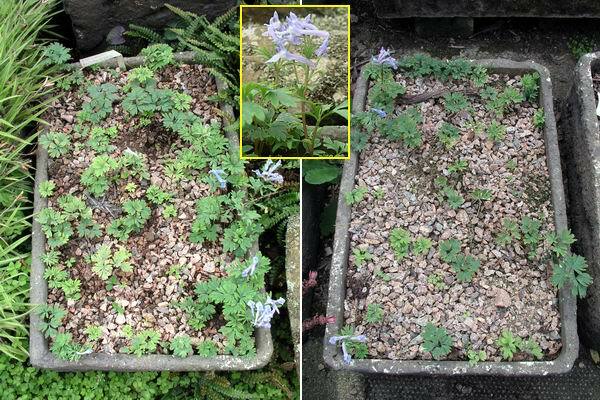 In log 28 I was repotting a fish box trough of Corydalis cashmeriana and made it into two troughs. Here are the two troughs putting on their second growth of leaves and this demonstrates how happy the plants are and how well they respond to being replanted after the spring growth dies back and before this late summer second flush. A few are even flowering but with purple blue flowers instead of the clear blue flowers they produce in spring. I believe that the flower colour varies depending on temperature, the colder it is the bluer will be the flowers - and this is so with other blue flowers as well. 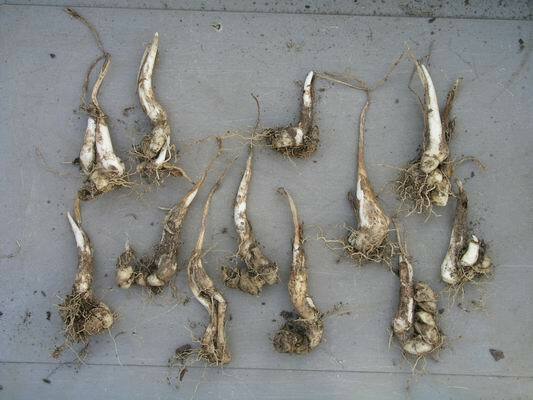 This is the remains of what was a pot of reasonably sized Fritillaria kotschyana bulbs after the terrible season we had this year. 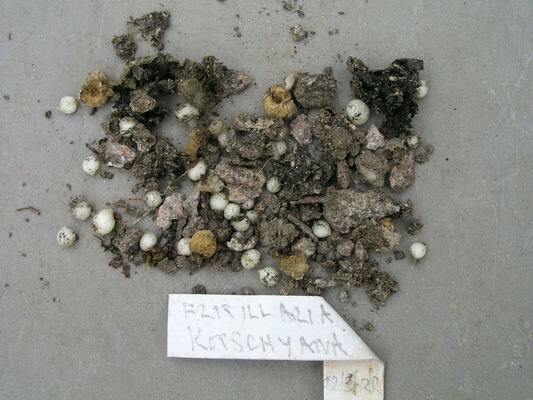 I have often said that bulbils have evolved partly due to foraging animals, I have attached below a short article I wrote for the Fritillaria Group Journal that gives some details of this theory. I now would like to add that it is also a distinct evolutionary advantage, if your main bulb dies due to bad climatic conditions, that a series of rice grains form to carry on the genes. Many of the frits that we grow in a "two steps forward one step backwards way" are rice grain producers. Can it be that these bulbs are less tolerant of cold damp conditions but have survived because they produce rice grains? 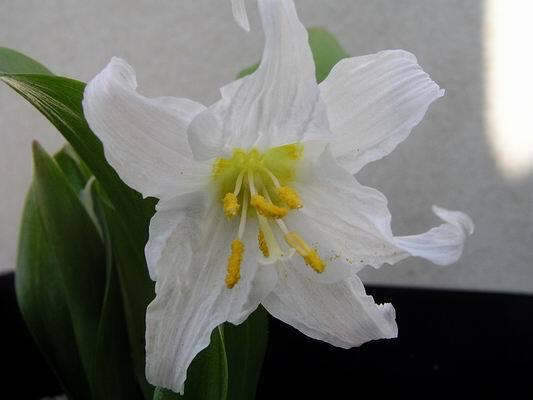 It would certainly seem to me, now that I think about it, that many of the ones that we build up a good stock of only to lose most flowering sized bulbs in a bad year fall into the rice grain producers - Fritillaria kotschyana falls into this group. I have a theory that the rice grain Frits have come about through a process of selective evolution aided by foraging animals including humanoids. An animal foraging for bulbs to eat would obviously concentrate on the large bulbs that provide the best snack and any small bulbils would drop back to the ground to grow again. If a bulb that produced no rice grains were to be eaten then its evolution would stop there so through a long process of natural selection the bulb that produces the most rice grains will be the best survivor. There are two main groups of rice grain frits the Eurasian and the American. I have been studying the growth patterns of these carefully and have selected F. hermonis amana and F. affinis as representatives of the two groups, they are both readily available, produce lots of rice grains and are fairly typical of the different bulb forms. F.hermonis amana is the typical two scaled frit bulb that is replaced annually. If it is growing well it can produce two flower stems per bulb and as a new bulb will form around the base of each stem you will end up with two flowering bulbs by the end of the growth cycle. When the bulb receives the autumn moisture the roots start to form and the shoot between the two scales starts to slowly expand. At the same time the rice grains start to form on the inside of the scales and around the growing stem. As the stem extends the old scales gradually give up thier store of food and shrivel until all that is left is a papery skin around which the numerous rice grains are clustered. It is at the time when the plant is (or would be) in flower that the new scales start to expand to form next years bulb(s). F.affinis is a typical N.American rice grain bulb not obviously two scaled but resembling a cup and saucer with a basal disc upon which sit various scale like eruptions. It is from the larger of these scales that the flower stem will arise. When growing well the bulb will get larger and eventually two scales big enough to support a flowering stem will appear on the same basal disc then the bulb, like the Eurasian type, will split into two with a new bulb being formed at the base of each flowering stem. In the seasons leading up to the two flowering stems the bulb will produce one flower stem and an immature stem often as a single large very broad leaf also seen on seedling bulbs as they approach flowering size. It is only been when we have had two flowering stems on a bulb that it has split into two bulbs. When the autumn moisture comes the bulb will produce roots and the bud expands, slowly at first and then rapidly in the spring as the stem breaks through to the surface and produces its flowers. During this period the old bulb gradually gives up its food store and shrivels away. It is when the flower stem starts to rise up that the new seasons bulb starts to swell and it is on this newly emerging bulb that the rice grains start to form, this is why the rice grains are attached to the bulb in the American frits. I believe that it does not weaken or harm the bulb in any way to remove all the rice grains from the parent and we do so every year. The rice grains grow on much better when separated from the parent and I also believe that the parent bulb performs better with the rice removed. I do not think that the rice is absorbed back into the parent if left attached, the connection is not sufficient. Instead I think that some will send up a leaflet and become independent and the rest just shrivel up and die away. So we have two distinct growth patterns: Autumn produced rice grains forming on the old bulb in the Eurasian group and spring produced rice forming on the new bulb in the American group. To return to my original theory this would suggest that the Eurasian group have evolved through being foraged in the Autumn while the American group have evolved to survive spring foraging animals.I have much to learn about the growth patterns of these fascinating bulbs and my experiments are ongoing, I look forward to learning more about the development and the evolution of Fritillaria.